Awakening cannot happen in the past nor in the future, only in the very present moment. This present precious moment of awareness is gradually imbued with the self-esteem, universal compassion and the transcendental perception of how things exist. Through this meditative investigation of reality, one can find everlasting peace and purpose in our lives. Join us for this special weekend retreat led by the beloved meditator and teacher, Venerable René. 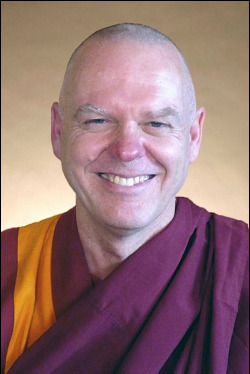 Ordained by the Dalai Lama more than thirty years ago, Swiss monk René Feusi has studied with some of the greatest scholars and inspiring lamas in the Tibetan diaspora. He has also performed numerous extensive retreats, including a two-and-a-half-year seclusion focused on developing mental stability. He has led large Buddhist events in Europe, Asia, and North America, and he has students worldwide. The resident teacher at Vajrapani Institute in the Santa Cruz mountains from 2001 to 2007, he now splits his time equally between teaching and retreat. He lives in Tonasket, WA. He has recently published The Beautiful Way of Life: A Meditation on Shantideva's Bodhisattva Path. Weekend sponsorships are available (see below): Sponsors receive priority seating, a special gift and skies of merit for sponsoring Dharma teachings for the benefit of other beings, which in turn enable you to receive more Dharma teachings. Sponsorship proceeds will go to teacher offerings and to acquiring the Kurukulla statue. Your generous donations are essential for the continuation of programs like this. No one turned away due to lack of funds — please contact us to make arrangements.